Argentines believe that, of the world’s top 500 companies, one in five (20 percent) has a female CEO – when the actual figure is just three percent. An overwhelming 81 percent of Argentines believe that violence – either physical, sexual or domestic – is the most important issue facing women and girls in the country today. Moreover, four in ten people globally specifically refer to sexual harassment as the main concern, the top answer picked out from a long list of equality issues. 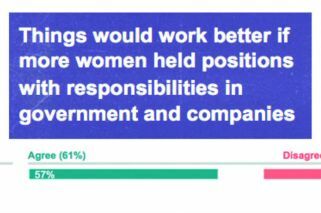 The findings are part of a new global study by Ipsos across 27 countries to mark International Women’s Day. The study also found that in spite of the #metoo campaign and high-profile cases that have shone a light on the issue of sexual harassment, in many countries people still believe that women who come forward with allegations will not be taken seriously. Across all 27 countries where the survey was conducted, half agree that reports of sexual harassment are generally ignored compared with 40 percent who disagree. The figure rises as high as 75 percent in Peru and Turkey. In Argentina, 51 percent agree that reports of sexual harassment are ignored nowadays, although that’s a considerable drop from five years ago when 75 percent believed reports were ignored, shedding some light on changing attitudes. When asked if they were talking about sexual harassment as a topic with their family, 6 out 10 interviewees replied affirmatively, saying it is something they talk about often. 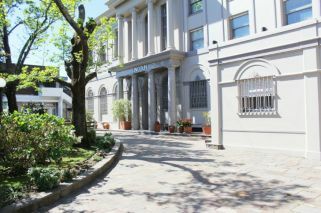 Argentina is among the countries with higher responses, along with Peru, Mexico, Chile and Italy. On the other end of the spectrum, almost half of the people in Russia and Great Britain say they aren’t talking about it at all. However, around the world there is strong support for a zero tolerance policy on sexual harassment; three-quarters (75 percent) of people around the world feel that this is essential to bring about change in society. Just one in six (16 percent) disagree. This data is reflective of a larger awareness of gender-based violence and sexual harassment in society. It is noteworthy too that after the first Ni Una Menos rally in 2015 in Argentina, the Supreme Court created the official register of femicide victims. Last year the INDEC statistics bureau published the number of complaints of gender-based violence (86,700), which quadrupled the 2013 figure (22,577), which was collected by NGOs. In developed countries, more people tend to stress that equal pay is a main issue facing women. It ranked as a top priority in Sweden, Germany, Belgium and Great Britain. In Argentina, it ranked lower than issues related to violence, sexualisation of women and girls in the media and gender stereotyping. Only 15 percent chose wages, distributed 18 percent among female respondents and 11 percent among men. On issues of harassment and violence, there is little difference between the views of men and women. However, women are slightly more likely to cite equal pay as an issue than men, as well as balancing work and caring responsibilities, and the amount of unpaid work women do such as cooking, cleaning and childcare. Nearly half of people globally (47 percent) and 56 percent in Argentina think that equality between men and women will be achieved in their lifetime. However, the reality, according to The World Economic Forum, is that this will not be achieved for another 217 years, at the current rate of progress. The 2017 Global Gender Gap Report says Argentina and Colombia are still the most gender-equal of the Latin America and the Caribbean region’s largest nations. Conversely, Brazil and Mexico are among those with the largest inequalities. The index analyses gender-based gaps in four areas: economic participation and opportunity, educational attainment, health and survival, and political empowerment. Misperceptions about attaining equality may be influenced by the fact that we think that aspects of women’s lives are better than they actually are. In particular, people hugely overestimate the extent to which women are represented in business leadership. Argentines, for example, believe that, of the world’s top 500 companies, one in five (20 percent) has a female CEO – when the actual figure is just three percent. People tend to be more accurate though when it comes to estimating the proportion of female politicians in their country. There’s a eleven-point gap between the actual number of female legislators (39 percent of the chamber) and how Argentines think they are (28 percent). 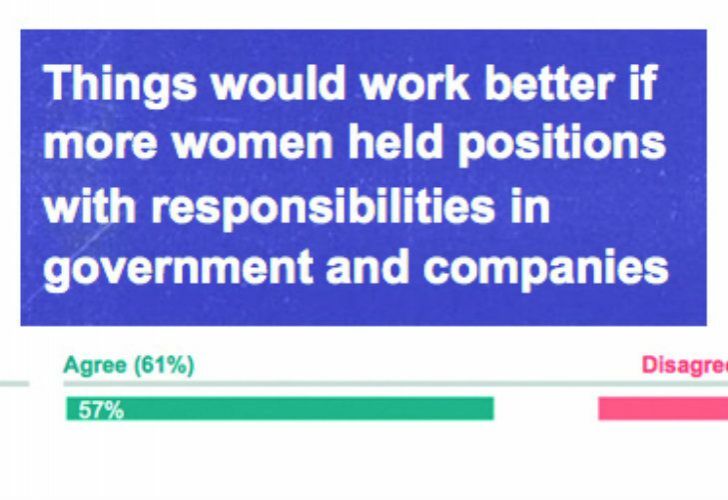 Even so, the majority view around the world is that women need to be better represented; 61 percent globally agree that things would work better if more women held positions with responsibilities in government and companies compared with 26 percent who disagree. Only in Russia do more people disagree than agree. Argentina is aligned with the global average: 57 percent agree with this statement. Social change is at our doorstep. Although there’s still a lot to be done, the vast majority of people (70 percent) across the world agree that achieving equality between men and women is important to them personally, and that counts for something.